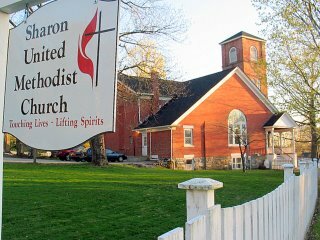 Sharon has five churches, all within a few blocks of each other on the green. All the major Christian denominations are here. This one is next door to my house and makes a nice landmark to describe how to get there, as everyone recognizes "the white picket fence in front of the Methodist church." It's quite lovely inside, too.